ALMOST 100 people, mostly women and children, died as a ferry packed with families celebrating Kurdish New Year sank in a swollen river in the former jihadist stronghold of Mosul, in Iraq’s worst accident in years. 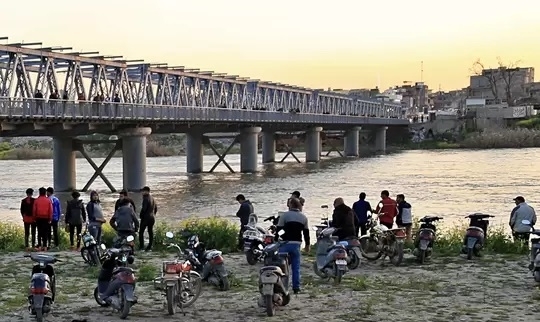 There was an outpouring of grief among residents who only this year resumed the annual festivities on the banks of the Tigris after the northern city’s recapture from the Islamic State group. Prime Minister Adel Abdel Mahdi decreed three days of national mourning as he visited the site of the tragedy. He ordered a swift investigation “to determine responsibilities”. The vessel was crammed with men, women and children crossing the Tigris on Thursday to go to a popular picnic area to celebrate Nowruz, the Kurdish New Year and a holiday across Iraq marking the start of spring. The accident, which struck as the overloaded vessel turned back, also coincided with Mother’s Day in Iraq. The Interior Ministry, issuing a fresh toll, said 94 people had died and 55 were rescued, after its spokesman Saad Maan said at least 19 children were among the dead. The premier said 61 women had died in the accident. While war and jihadist attacks have claimed hundreds of thousands of lives in Iraq in recent years, such accidents are relatively rare. “It’s a disaster, no one expected that,” said a young man who had just managed to reach the shore. “There were a lot of people on the boat, especially women and children,” he told AFP. A Mosul security source said the high water levels and over crowding on the boat, with wellover100peopleonboard, had been to blame for the disaster. “The boat sank because there were too many passengers on board,” another security official based in Mosul told AFP. Iraq’s Justice Ministry said it had ordered the arrest of nine ferry company officials and banned the owners of the vessel and the tourist site from leaving the country. The authorities had warned people to be cautious after several days of heavy rains led to water being released through the Mosul dam, causing the river level to rise. Videos shared on social media showed a fast-flowing, bloated river and dozens of people floating in the water or trying to swim around the partly submerged boat. Search operations stretched far downstream from the site where the boat sank, according to an AFP journalist. Hundreds of people who had flocked to the forested area for the first days of spring gathered on the river banks as the disaster unfolded. Ambulances and police vehicles transported the dead and wounded to hospitals in the city of nearly two million people. Photos of victims, many of them women and children, we reposted on the walls of a morgue for families unable to enter because of the large crowd who had gathered to identify their relatives. One man, scanning over the pictures, stopped abruptly at the image of a woman. In shock, he gasped:“It’s my wife”, before collapsing in tears. IS turned Mosul into their de facto Iraqi capital after the jihadists swept across much of the country’s north in 2014. The city spent three years under the group’s iron-fisted rule until it was recaptured by Iraqi troops backed by a USled coalition in 2017.